We can offer all of these courses by arrangement for groups, clubs and individuals. Please get in touch to discuss your needs. We can deliver training and assessment course to help you progress your skills and develop your confidence in planning and undertaking journeys on the sea, in winds up to and including force 3 and/or tides up to 1 Knot, using sea kayaks or sit on tops, in tidal or non-tidal environments. The Coastal Sea Kayak Award endorses your judgment, decision making and expertise and requires a good understanding of paddling on the sea. You should be confident planning and undertaking journeys on the sea in winds up to and including force 4 and/or tides up to 2 Knots, in a sea kayak or specific sit on tops in tidal or non-tidal environments. 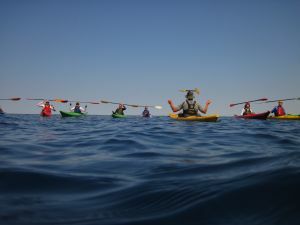 An ideal stepping stone to the Sea Kayak Leader Award if you wish to lead or a valuable skill benchmark for personal satisfaction. We can offer both training and assessment for this award, the nature of this award lends itself to modular or bite size training.